The good news is that spread betting is tax free* making it a cost-effective alternative to traditional share trading, although UK tax laws may change in the future. Spread betting allows you to speculate on the movement of shares, indices, forex and commodities without using a stockbroker, so you don’t usually have to pay commissions or broker’s fees. The way it works is that a spread betting company makes a spread around the live, underlying market price and you can bet on whether this market will rise or fall. 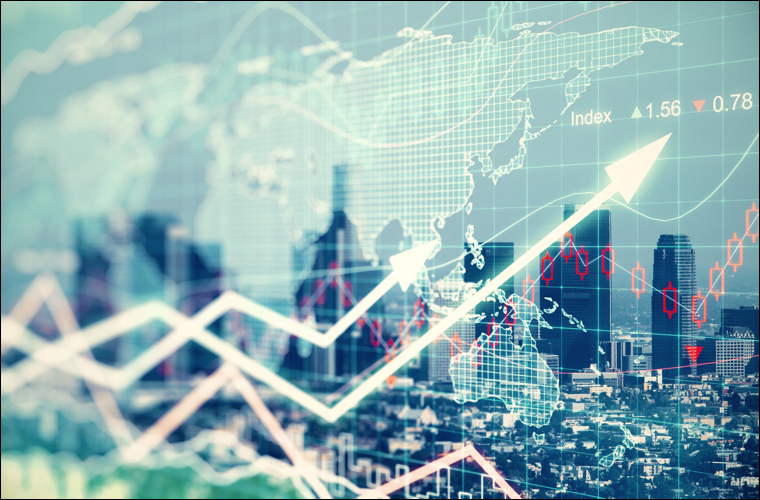 More good news: spread trading on the movement of financial markets gives the opportunity to generate profits on both rising and falling markets. So you get all the benefits of speculating on the markets and because it’s a geared product you can trade for a fraction of the cost, increasing your potential ROI. It’s important to remember that substantial rewards can also mean substantial risks. With spread betting, you could actually lose more than your initial capital deposit or stake. Trades can and will turn against you sometimes so it’s important to speculate only with money that you can comfortably afford to lose. And it’s OK to lose trades; in fact, professional traders do expect to lose trades some of the time. What makes the difference is that they hope and expect their wins to exceed their losses in monetary terms. Please make sure you’re aware of the risks and, if you’re in any doubt, consult a qualified financial advisor. Once you understand the risks involved, please make sure spread betting fits your investment objectives. Enough of that, let’s get on with showing you how it all works. The ‘spread’ in the phrase ‘financial spread betting‘ refers to the difference between the Sell (Bid) and Buy (Offer) price quoted by the spread betting company. This price is calculated around the live, or the estimated future, market price of a financial instrument such as a financial index like the FTSE, a commodity like gold, or the share price of a company such as BP plc, for example. When you spread bet, you don’t buy the share. You don’t own anything. Instead you simply bet on which way you think the market or the share price will move, either up or down. It’s not rocket science. With Tradefair, the minimum bet, or stake, is currently £1.00 per point. How much you make or lose depends on the difference between the opening and closing price multiplied by your stake. Time for a quick couple of examples / spread betting guides to illustrate the concept. You need to be aware that your losses can increase dramatically if the markets move against you rapidly. Spread betting companies want you to enjoy your spread betting and profit from it. So again, please be aware of the risks as well as the potential for profit. One thing to note is that UK tax laws may change in the future and outside the UK tax law may be different. While there are some distinct similarities between traditional share dealing and spread betting, there are also some big differences as well. This spread betting guide looks at what differences there are in terms of cost and risk. 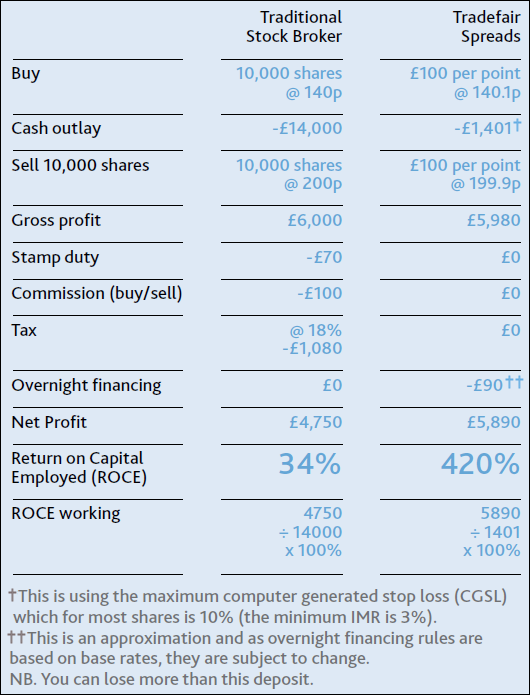 If you buy 500 shares in Schroders at 860p, your total exposure (or investment) is £4,300. The equivalent in a spread bet is £5 per point at 860, with the same total exposure of £4,300. However, with a spread bet, you don’t need £4,300 in your spread betting account to open the position, you only need a small percentage (3% for a FTSE100 share). In this example it would be £129 (3% x £4,300), known as the initial margin required (IMR). With only £129 of margin required to open a trade worth £4,300 this means that you have freed up £4,171 of capital to put to use elsewhere should you wish. The table below illustrates how a share investment held for 30 days with Tradefair might compare to a spread bet. If you wanted to, you could try running a share-dealing account and a spread betting account in tandem. There’s no better way to see how cost-efficient spread betting can be compared to dealing directly in equities. You can trade all of these things and more from a single spread betting account. Some spread betting companies also allow you to trade in a selection of currencies; most typically you can trade in sterling, euros or dollars. Whether you’re betting on the relative value of the pound against the dollar or American government bonds, your profits will always be in the currency you have chosen so you’ll always know where you are financially. With Tradefair, you have instant access to the world’s financial markets at low cost. What’s more, finding your way around the platform’s trading screen is a breeze. A couple of clicks is all it takes to trade any one of over 2,000 markets including shares like BP or Vodafone, indices such as the FTSE and the Dow, bonds, currency pairs like the pound against the dollar and commodities such as gold and oil. It’s all available directly from the platform. 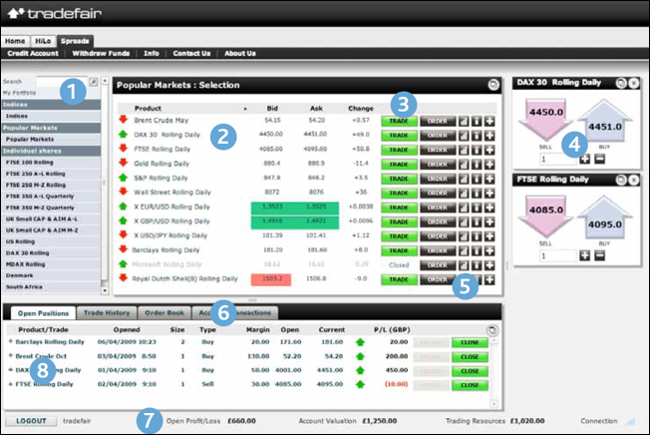 The image below is a screenshot of the Tradefair trading screen. There are several key features to note. An intuitive menu system and search tool offer two fast and powerful ways to get to the financial spread betting markets that interest you the most. Log in and you’ll go straight to the trading screen. By default, Tradefair show you the most popular markets: indices like the FTSE and the DAX, forex like the pound / dollar rate, and commodities like gold. Click the green trade button to open a trade ticket. To open or close a trade at a level in the market which hasn’t yet been reached, click the ‘order’ button. 4 – Higher or Lower? Think the market’s going down? Click ‘sell’. Going up? Click ‘buy’. Stop losses are inserted automatically although these aren’t always guaranteed. Adjust the stop losses on any trade, subject to your available funds, to suit your needs. The platform offers charts and tools to help you research your trades. Want to see three-way moving averages or momentum or volatility? It’s all here. See how each position is doing and act on it independently. Taking a hit? Shut your trade down in seconds. Moving along nicely? Watch your trade grow. 7 – Are You Winning? View your recent trading history, current and future orders and a list of account transactions all without leaving the trading screen. See how your open trades and account are doing by looking across the bottom of the screen. It’s all about making money, right? If you’re planning to get in and out of a trade within a month, a ‘rolling daily’ spread bet may work out cheaper. If you’re looking longer term, for more than a month, a ‘futures’ trade is often more cost effective because, although the spread is typically wider, the contract takes into account overnight financing – i.e. you don’t pay financing every day. Here is an example of a ‘rolling daily’ trade. 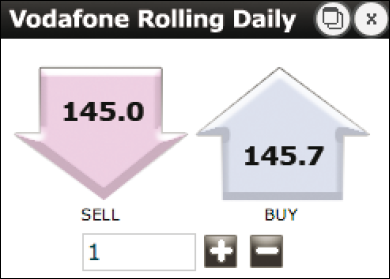 Once the available Vodafone trades appear on screen, click ‘TRADE’ next to the one you want, in this example, the ‘Vodafone Rolling Daily’. Enter how much you want to trade. 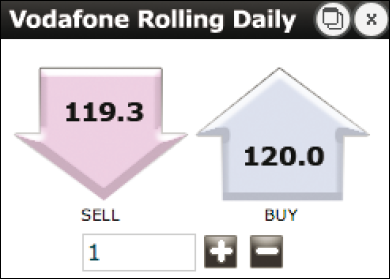 With Tradefair, the minimum position allowed on Vodafone is £1 for every penny the share price changes. Once you’ve entered your pound-a-point stake, click ‘buy’, because you think the price will rise, and at that point you’re in the game or involved, as investors often say in the trade. A message will open up to confirm what you’ve just done, it’ll have a reference number on it and the platform will automatically send you an email confirmation for your records as well. You’ve just bought Vodafone at £1 a point when the price was 120p so your total exposure is £120.00, exactly the same as owning 100 shares in Vodafone. Let’s say for this example that Vodafone’s share price rises from 120p to 145p over the next ten days. Your position now has a notional value of £145 and you decide to take the profit now. To do this, click on ‘TRADE’ in the ‘Open positions’ part of the trading screen. Click the ‘sell’ button. Your trade closes instantly and you’ve banked a £25.00 profit. (£1 x 25 points = £25.00). Note that there may be overnight financing charges for a rolling daily bet, for more details see the feature, Rolling Daily Spread Betting. The following video takes a quick look at how to place a trade. This video covers the Spreadex platform but most spread betting platforms work in a similar way. What Level of Investment Should You Make? It’s vital to remember how much you’re actually risking and you must be comfortable with the amount of money involved. Before you risk any real money, it’s worth practising with a demo platform to help give you an idea of how changes in market prices affect a particular stake.